Have smoked many cigars over the years and have found the Quorum to rate just as well. It's an inexpensive smoke but just as enjoyable as the $10.00 smoke. Smoking these for years before they became even more popular. Have been smoking Quorums for years and they still continue to compare with more exotic smokes. This is the best bang for the buck. 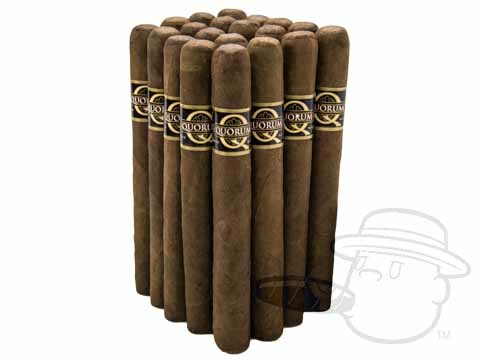 I like Quorum cigars because they are very good cigars at a reasonable price. The quality is very consistent. I like the taste and burn. I'm a chewer and always enjoy these and the experience of Best. For all the cigar poachers that come to your house empty handed looking for you to supply them with a good smoke, this is your answer. An inexpensive solution to sharing a smoke with a party guest without breaking the bank. A tasty smoke with good gauge and length and a consistent burn. I would recommend others try a pack of 20 of these at your next gathering and you'll find happy guests and you don't feel like your humidor has been raided! I real nice yard working cigar. Don't expect this cigar to compete with pricier ones and you won't be disappointed. I ordered a two bundle deal and got a good price, fast service and am very satisfied. I will order from these guys again. These cigars are hard to find but never here. Always fresh and in stock. This is now the only on-line cigar site I use. I'm a life long customer. Perfect paor for coffee. Love it. Nice draw, even burn, great aroma. Will buy again.Now one of my favorites. Amazing value as well. Tasted great, only issue was draw. They were rolled too tight, each bundle had 4or5 that had to be thrown away. A few I could cut down to Nub length. Just what my husband was looking for. I was introduced to Quorum by my local tobacconist when I was low cigars and I needed some before my online order would arrive. It smoked well and had such great balance. Just the right price. Smokes long enough for the enjoyment of low price cigars. For the price of these,they are a 5 star smoke, a very good,slow smoke for everyday and golf. easy draw ,slow burn and it don't go out in between shots. The only cigar I will smoke. Love the taste, the length and the way they last. I really like these. Excellent price. I enjoy them as much as any cigar. Cost and what one likes do not necessarily equate. For example I've had wines that are expensive that I do not like as well as others that cost much less. Same is true of cigars. First off, the price is amazing for this cigar for what you get out of it. I picked this up at a local shop and wasn't expecting much but this just wasn't the case. Superb value, but no Baccarat hahaha. Highly recommend for the value because the only negative part is that I wish the flavor could have been stronger although at this price, it doesn't really matter. The Quorum Toro is a decent mild smoke when just want to have a cigar to kill time and just because you have a need to fill. Well made cigar, with a bit of an edge. Quorum Toro Natural is rated 4.2 out of 5 based on 38 customer ratings.